Zameen.com unveils a new outlook to facilitate the oncoming demands of its increasing clients and to make it more user-friendly. 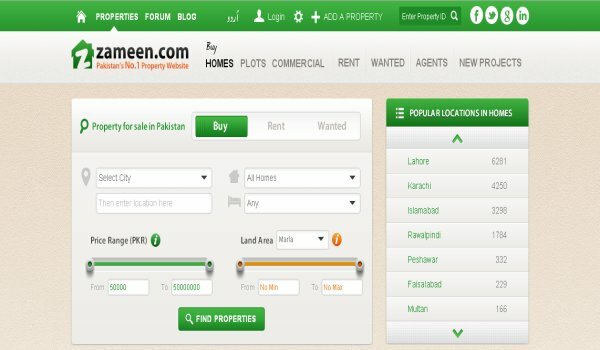 The move was taken after several surveys that were conducted regarding the specific preferences of the users of the leading property portal of Pakistan, i.e. Zameen.com. Zameen launched a prototype version of its new look on Preex Property Expo 2013 and was applauded by the real estate agents and property developers visiting the event. The opinions and the feedback of the visitors and clients at the expo were taken into consideration as well and the new look was then further modified and moulded as per the preference of the prised users. At Zameen it is all about ease and accessibility. It is a fact that the aim behind developing such an all-encompassing property portal in Pakistan was to bring authentic property options and real estate agents closer to the people in order to facilitate crystal clear property transactions in Pakistan. Zameen.com exists for its nation and for its beloved country so utilise the array of services the online portal has to offer because at Zameen it’s all about you!